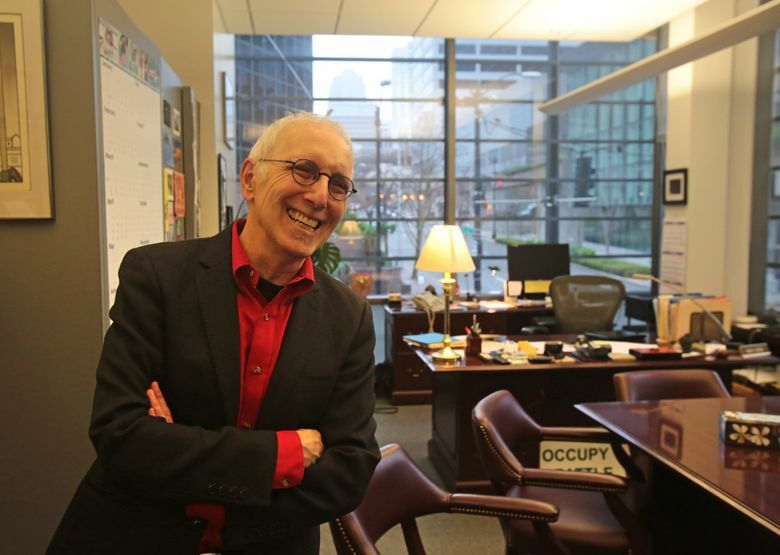 Struggling to meter his daily doses of the president, former Seattle City Councilmember Nick Licata raises the issue: Is Trump addiction a thing? When Nick Licata retired from politics two years ago, he figured he’d get some refreshing distance from the all-consuming experience of being in the arena. Some quiet from the constant battle of politics to recharge for his next chapter. “I am a Trump addict,” the longtime former Seattle City Council member confessed to his 4,600-person email subscriber list the other day. “I’m worried about you, man,” I said when I caught up with Licata by phone. You see, Licata recently wrote a book called “Becoming a Citizen Activist.” It’s a how-to on political engagement. One of its central premises is that too much negativity in politics, while potent, can backfire. That’s pretty much the opposite of what he now finds himself doing on a daily basis, he admits. Which is obsessively following the daily Donald Trump Twitter outrage as it rockets across social media each morning, and then onto the inevitable “knights of the political roundtable” discussions on the cable networks. “I’m on MSNBC, CNN, even Fox News, usually in the morning and then often checking back in around dinner and later at night,” Licata said. “I do wake up wondering: What did Trump say today? But also what the pundits have to say about what Trump said. And on and on, until it all starts over the next day. Licata, who otherwise is kept busy baby-sitting his 11-month-old granddaughter, decided to write “I am a Trump addict” to his friends as a sort of liberal therapy exercise. In professional wrestling they call what Trump is doing “working the marks.” It’s a technique to elicit charged emotional reactions from the crowd, as a means to get them to suspend their disbelief that the whole enterprise is an obvious con. In Trump’s case, liberals are now the main marks — the ones getting whipped up day after day. To try to keep that from happening to me, I have only written about Trump a few times this year. And then only in relation to what his administration is doing, such as a proposal to drill for oil off the Washington coast, and the rejection by Congress of his proposed budget cuts affecting Washington state. But admittedly that all feels totally irrelevant to the big story: the daily chaos, the investigators closing in, the brewing constitutional crisis. Unlike Licata, who can’t look away, I think I have instead retreated to the point of being gaslighted. This is the saying for when the lights are turned down incrementally by a tormentor until the room is pitch black. Only it happens so gradually the darkness falls without you even noticing. Licata is the civic-engagement expert, so I ask him: Is there a sweet spot somewhere between gaslighted and obsessed, where a citizen can remain informed and alert while not being swept by Trump down a rabbit hole of crazy? “Focus on the policies that are flying from his administration, and organize around those — either for them or against them,” Licata said. “Don’t focus on his tweets, his rudeness, his personality. Take it from him. And maybe, while you’re at it, also take away his remote control.